My husband and I have a thing for traditions. This extends far beyond the normal holiday/summer vacation traditions that limit most people. No, we can make traditions out of practically any event in our life. We even have a place we have to eat at after a hospital visit. Today's tradition though, is about our Friday night ritual. Every Friday night for the past few years we drive somewhat impractically out of our way to a carhop diner called Kirt's. 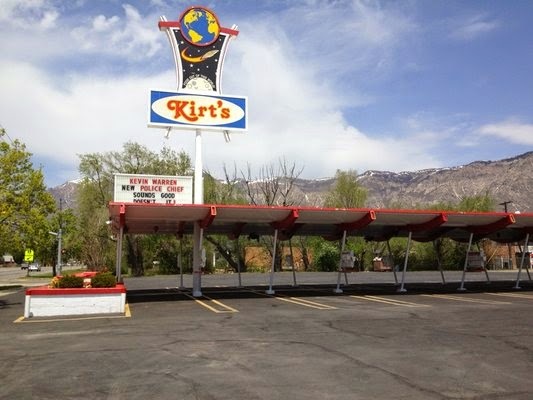 Kirt's is a locally owned throwback drive-up restaurant serving typical diner food. Their cheeseburgers are amazing, their french fries are the best I've ever had and their prices are the lowest we've paid for a meal in a long time. The owners are extremely friendly and lest you think we only make a tradition out of the place we eat, they even remember what meals we order (because it's practically the same thing every time.) There's something incredibly comforting about eating at a place that knows your car and food order by heart. If you live up in North Ogden, I'd definitely suggest giving Kirt's a try! Note the sign which often features local news! Tell me, what are some traditions you have?